Coaching is available at our club! Our resident coach, Bunny Lee, is happy to talk about new training opportunities. Coach Bunny first established the BTTC coaching program in the summer of 2007. They started training in a small common room on the second floor of the James Kenney Community Center with only 8 students and 4 tables. As the number of students increased, they moved to the gym in 2009. Coach Bunny was born in Hong Kong, China and came to the United States as an immigrant with his family. He started playing table tennis when he was 13, which was considered quite late. He was selected to be in his high school table tennis team, but without parental support, could not play competitively. Coach Lee used to play penhold with short pips on one side, but now plays shakehand with inverted rubber on both sides. Our program meets every Saturday from 7:00 PM to 9:00 PM at James Kenney Community Center in Berkeley. Players of all levels are welcome to join. 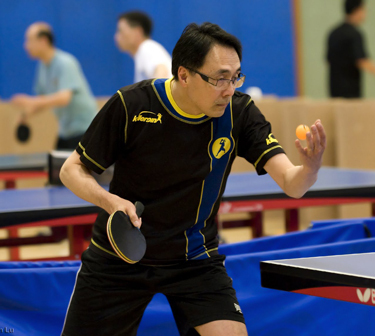 The program’s main goal is to help players master many different skills in table tennis, so they can play competitively and of course, have fun. Coach Bunny also offers private coaching. There is a 1-hour minimum for local students. There is a 2-hour minimum for out-of-town students, plus travel expenses.